Citroen - Honda | What Car? Citrons have been less reliable this year, so the company has slid down to a mid-table position. This continues a falling trend since 2006, when Citron finished an impressive 6th overall. This year, repair bills were acceptable at 226, but cars took longer to fix than most. 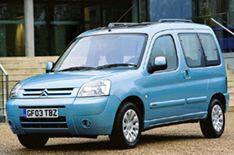 Surprisingly, the Berlingo Multispace proved the most dependable, but the more modern ('02-present) C3 was only just behind with 23 claims per 100 cars. Daewoo managed a respectable mid-field position. Repair bills were average, yet Daewoo owners enjoyed the lowest average labour rates around, at 40 per hour. The Nubira was easily the worst model, with a breakdown rate of 42 per 100 cars, in stark contrast to the Matiz, which suffered just 22 breakdowns per 100. As with other marques, axle and suspension problems were the biggest single issue for Daewoos. Fiat has fallen significantly in this year's results, and now finds itself in the lower third overall. The Brava was head and shoulders above its stablemates, however, with only 16 problems per 100 cars. At the other end of the scale, the Bravo, Multipla and Coup all recorded 44 breakdowns per 100, and earned a reliability rating of only two out of five. Ford might have dropped back to ninth position this year, but it's still showing an overall improvement compared with three years ago. The Fusion was the only model to receive a reliability rating of five out of five, finishing an impressive third overall with only four breakdowns per 100 cars. Most models achieved average or above-average results, although the ('95-'00) Galaxy narrowly beat the ('95-'98) Scorpio to the dubious title of worst Ford, with 43 breakdowns per 100 cars. Honda continues its run as king of reliability, by taking the top slot for the fourth year on the trot. All of its cars bar one, the ('97-'01) Prelude, managed the highest reliability rating, and even the Prelude got a rating of four out of five. Honda's engines proved durable, accounting for less than 3% of claims. The result shames that of other car makers the best models from Land Rover, Renault and Seat all failed to beat Honda's worst.